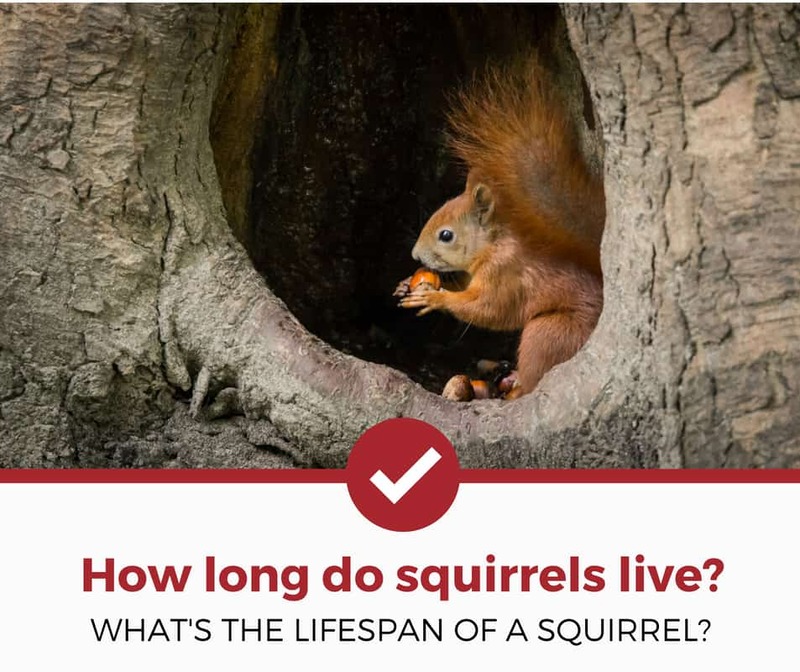 Whether you want a squirrel as a pet or just want to figure out how long your yard's invaders are going to live, knowing a squirrel's lifespan is helpful. All species of squirrel are different, so they naturally possess different lifespans. Squirrels in captivity also live much longer than outside, wild animals. In fact, most squirrels do not live past their first year of life! Does Diet Affect a Squirrel's Lifespan? Closing Thoughts On The Squirrel Lifespan..
A squirrel is both a rodent and a mammal. They are mammals because they are covered in hair and have mammary glands to feed their children milk. They count as rodents because they gnaw on things with their powerful, over-sized incisors. Squirrels can be found all over the world in places like North America, Europe, Africa, and Asia. There are currently over 200 different species on earth, each with its own diet and separate habitat. For this article, we focus on North America. Squirrels can be divided into three different types: tree, ground, and flying. Tree squirrels tend to live in burrows within trees or will build nests between the crooks of branches. Ground squirrels naturally live in the ground, typically in dug-out burrows they make themselves. Flying squirrels are a special case. Some live in holes in trees, others build nests, and others live in a new place every night to avoid predators. Since they can move from tree to tree using their "wings," this is an excellent survival mechanism. Squirrels are omnivores, which means they eat meat, vegetables, and usually anything they can get their paws on. Their favorite foods include fungi, seeds, nuts, and fruit, but they will also consume insects, eggs, and even small snakes. Squirrels bury a lot of food in preparation for winter, and it's not uncommon for squirrels to steal from the storage spaces of others. There currently isn't a lot of research that measures whether the food a squirrel eats actually affects their lifespan. A squirrel with a more varied diet is likely to survive, but because these animals tend to only eat healthy foods, they don't suffer the same problems that humans do. A squirrel is more likely to get hit by a car then die of heart disease! Squirrels in captivity - like in zoos - can live a whopping 24 years, which is longer than most dogs and cats. However, a regular squirrel faces a lot of threats in its day to day life and don't live long. Like mentioned earlier, most of these animals don't make it to their first year. When they do, they can live to be between 6-10 years old. When discussing age, this article divides squirrels between some of the most common types. American red squirrels are some of the shortest in North America and actually tend to live in Canada or the far northeast of the United States. They can live to be 8 years old but most wild ones barely make it to 2 years. This species is slightly different from others in that the males actually tend to live longer than the females. However, the amount is negligible and only longer by a few weeks. Fox squirrels are the most common kind in North America and have the typical rich, chestnut brown color people often associate with this mammal. They can live to be 18 years old, but the maximum ages discovered in wild squirrels have been 8 years for males and 13 years for females. The southern flying squirrel is a bit of an outlier in the squirrel world. These unusual mammals only live between 3-5 years and are the only flying squirrel in North America. This squirrel species is typically found throughout the Midwest and is what many people in the United States might think of when trying to imagine a typical squirrel. It's furry and adorable, and can live between 12-24 years in the right environment. Sometimes people might encounter an all black squirrel, especially in the Midwest. They aren't a separate species, but actually occur from different levels of melanin in the animal's body. They tend to be either eastern gray or fox squirrels with a different hair color. Most live to be about 6 years old in the wild or 18 years old in captivity. Squirrels, like most other animals, have drastically shorter lifespans in the wild than in captivity. If you are worried about one bugging you forever, rest assured it will most likely perish within a year. If you don't want the squirrel gone or want one as a pet, then the good news is that those who make it past the first year will be around for a long time. Excellent article and info. Thank you! I feed my squirrels every day, along with the birds.